Impact Wrestling has announced the date and location of their next pay-per-view. 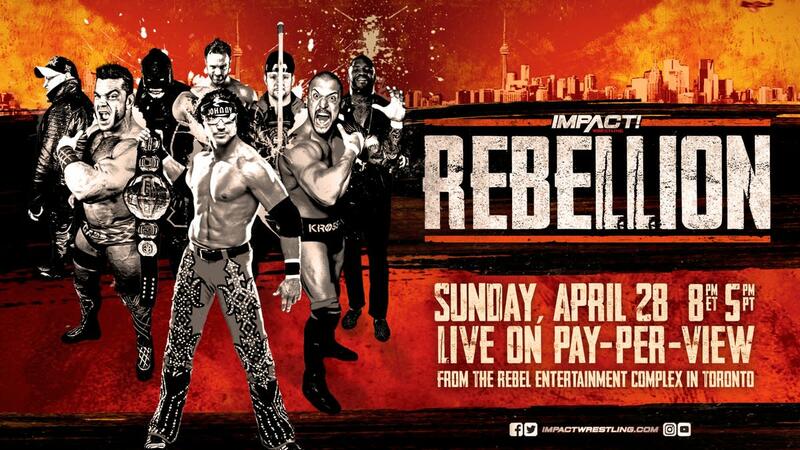 During last night's episode of Impact, it was announced that "Rebellion" will take place at the Rebel Entertainment Complex in Toronto, Ontario, Canada on Sunday, April 28. This will be Impact's second PPV of 2019. The Rebel Entertainment Complex also hosted Impact's Slammiversary XVI event in July 2018. Tickets and VIP packages for Rebellion will go on sale at noon Eastern on Monday, March 4. Before Rebellion, the next special episode of Impact will air on Friday, February 15. It's being called "Uncaged" and will feature Johnny Impact defending his World title, Taya Valkyrie defending the Knockouts Championship against Tessa Blanchard in a street fight, and Team Impact (Sami Callihan, Eddie Edwards, Eli Drake & Fallah Bahh) vs. Team AAA (Psycho Clown, Puma King, El Hijo del Vikingo & Aerostar) in a World Cup match. Pentagon Jr. & Fenix challenging for LAX's Tag Team titles will air on next Friday's Impact. The announcement video for Rebellion is available to watch below. It mentions an "ultimate battle" for the Impact World Championship.